Jiang Bo, an online broadcaster, wanted his fifteen minutes of fame so badly that he decided to create a buzz – one that included not only people discussing him both online and offline, but also a swarm of agitated bees attacking him. The Chinese broadcaster who had been dabbling in the livestreaming industry for about three months, was apparently not satisfied with the amount of fans who were keeping up with his life in southwest China’s Chongqing municipality, and sought to attract more traffic to his online channel. As is with a growing number of internet celebrity wannabes compelled by a mania for live-streaming in China, the young man decided to take a shortcut and put on an extreme live show that he thought would catapult him to stardom – but instead, Jiang landed in the emergency room, and from there to an intensive care unit. His stunt saw him putting on a motorcycle helmet and donning a raincoat before being lifted with the help of a crane, which he rented for 500 yuan (75 US dollars), to a hornet’s nest that he sought to agitate. It wasn’t long before the daredevil was stung into a coma, suffering from 37 stings. 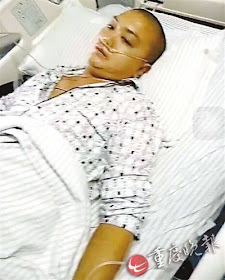 He was admitted to the ICU, and his hospital bill amounted to 10,000 yuan (1,500 US dollars). However, Jiang got what he had been looking for as his video received 11,000 views, and a flurry of comments – mostly unfavorable, but bad publicity is good publicity one would argue.